A lot of things has been online in recent times concerning the proper Igbo leaders and what component one needs to be a leader in Igbo land. Some has taken the opportunity they had as political jobbers now claiming to be Igbo leaders, unfortunately since after the demise of Eze Igbo Nile, General Emeka Odumegwu Ojukwu Igbo has never had any leader not until the coming of Mazi NNAMDI KANU. For the benefit of those who don't know, leadership status in Igbo system of life are not gotten by political ability or by financial ability of an individual. If I may refer you to Chinua Achebe's things fall Apart which portrays in detail the typical Village setting. OKONKWO did not became a leader by bribing his way to be voted as one, rather he became a leader in Umuofia due to his bravery and ability to bring down Agbalanze; the Cat in a wrestling contest. Today People force their way into leadership through their ill-gotten wealth. You see some people dividing their Community into two after engaging in 419, drug dealings or ritual killings and they will become Eze of one part, and the question to ask is What type of Eze are they? 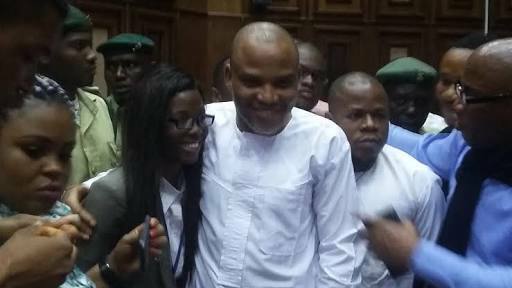 NNAMDI KANU has acquired his leadership status today in Biafra land and Igbo land in particular through his bravery and gallantry in defending his People. You cannot do this without a 100% love for your people. He love his people and ready to die because of them. But look at those political jobbers who claim to be Igbo leaders, which one among them can say that he loves his people instead they defend Abuja even if it means killing his people to impress Buhari; in other to maintain political relevance, they do it. Some people are jealous and envious saying why must it be NNAMDI KANU, who is he, who is his father, how rich is he to be addressed as Igbo leader, by the way who knows him? Many questions like this keep coming up from different quarters. As he started talking on Radio Biafra then many started opening Radio Stations but today where are they? When he came up with Biafra TV, every corner people were opening TV stations; today where are all of them? If you are not called, you are not called; don't do because Okeke have started doing it, it is a jealous act. In Igbo land leadership status were attained by ones gallantry and bravery in defending his people not by political status which are not gotten by merit but by killing and betrayal of his own people.